I think the trip will be a great experience for Andi (our new pup) and I. And as it turns out – Ted is joining us as far as New Orleans. San Luis Obispo to Las Vegas (to eat, or course). Las Vegas to Page Arizona (to fossil in Big Water Utah). Page to Canyon de Chelly. Chinle AZ to Payson (more fossils). Tucson to meet up with Tim (brother-in-law) and his wife Pim at the huge Gem and Mineral Show. Tucson to Carlsbad Caverns. Carlsbad Caverns to some route across Texas with major fossil hunting at Lake Texoma. Then on down Rt. 90 into the Mississippi Delta area eventually arriving in New Orleans for 2 nights (to eat more). Then Ted flies home and I am off with Andi to Florida via more Rt. 90 into Florida and to Deland. Ted will meet me up again in Orlando with Nimbus (the cat) and we will all travel together to St. Croix! Phew! 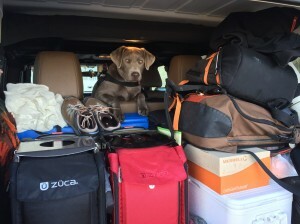 Andi in the jeep – ready to go!